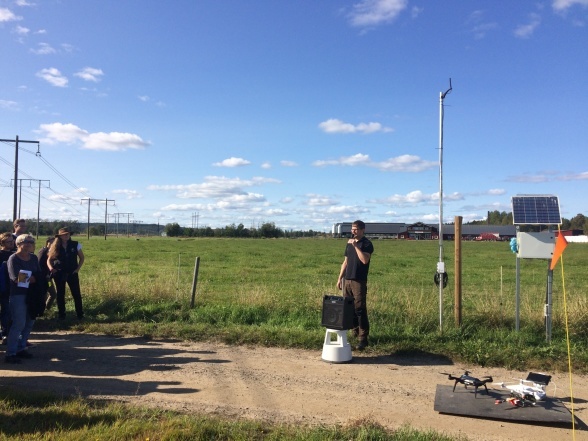 Röbäcksdalen is part of the monitoring program SITES spectral, but there are many additional spectral things going on at the station. 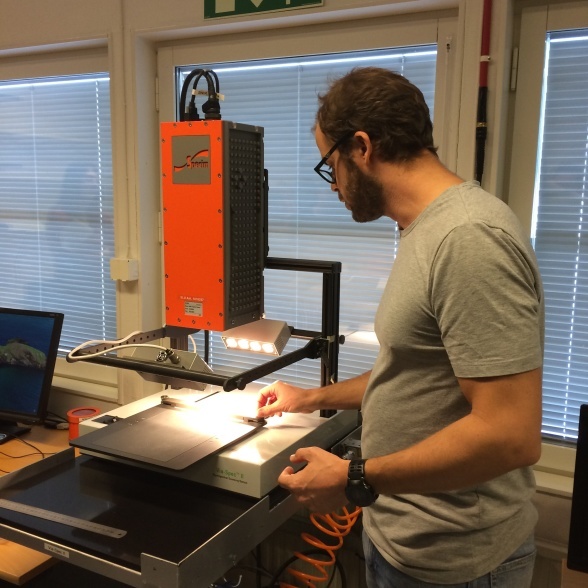 On March 21 Julien Morel, post doc at the department of Agricultural Research for Northern Sweden, held a crash course for technicians and researchers in how some of the spectral instruments at Röbäcksdalen works. The most used device today is the hyperspectral camera, which can be used to analyse a number of different things including plant chemical composition, meat, cheese, wood products, pharmaceuticals, and much more. Among the portable devices for field measurements the field spectrometer is a new recruitment to the lab, which will be tested a lot this summer. Not even the cows in the barn escapes the spectral techniques. There are GreenFeed units in the stables that measures the flows of methane carbon dioxide and oxygen from the cows when they consume concentrates. You can read more about the lab on our webpage www.slu.se/njv/spectral. Håkan Nilsson presents SITES spectral at the Röbäcksdalen harvest festival August 2018. Fotograf Johanna Wallsten. Julien Morel is demonstrating the hyperspectral camera during the crash course Fotograf Johanna Wallsten. Photo: Me wearing a Peruvian traditional hat and poncho. I’m originally from the UK, where I completed a PhD in Atmospheric Science at the University of Leeds. I’ve worked as a postdoc in Ireland, London, Cambridge and Spain, on projects involving measurements of greenhouse gases, air quality and halogens. I’ve spent the last two-and-a-half years living in Madrid with my girlfriend who is Peruvian (hence the photo) learning Spanish and enjoying the food and drink! I previously worked here as a Research Engineer during the installation of the ICOS infrastructure in 2012-2013. I returned in 2014 and 2018 to help out during the summer field season, so I am well-known to the staff and I am familiar with the wide variety of work that goes on with regards forest ecosystems. Unable to find further funding or other opportunities in Spain, I decided to contact my colleagues at Svartberget to see if they needed help or had any jobs. They needed a Research Engineer, so I applied and I was lucky enough to get the job. I enjoy the clean air, forests, lakes and rivers in the region around Vindeln. Swedish people value their free-time and are friendly and helpful, and I like the idea of ‘fika’ at work. I’m looking forward to finally learning Swedish properly and welcoming my girlfriend, friends and family to explore the region. I will mainly be working on supporting the ongoing measurements as part of ICOS, and working with my colleagues on maintaining and extending the SITES measurement programmes. I am interested in developing new measurement technologies at the station, and using data mining techniques to better understand the wealth of data we have, and the story it can tell. What are your expectations for your assignment at SITES? 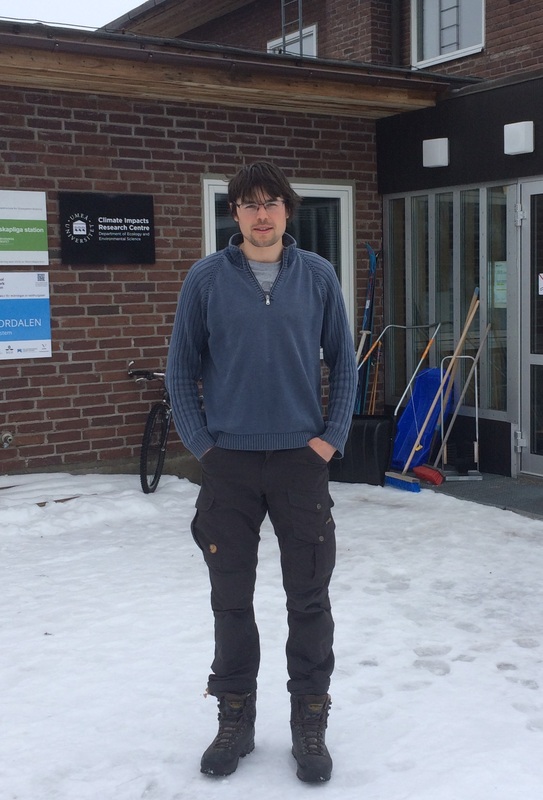 To run the internationalisation of Swedish field research stations through LTER (Long Term Ecosystem Research). I am the coordinator of LTER Sweden, which is almost a parallel to SITES. All SITES stations are now members of LTER Sweden, and the plan is to increase the European cooperation though LTER. 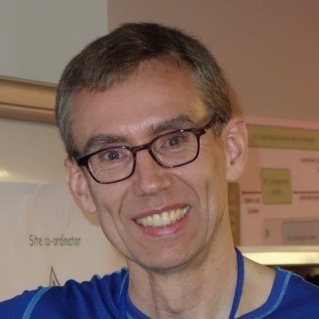 I have a doctors degree in plant ecology from Uppsala University and came to SLU to run the Swedish vegetation part of the international environmental monitoring program, ”ICP Integrated Monitoring (ICP-IM)”. I still work with this but am now also chair of the international ICP-IM program. 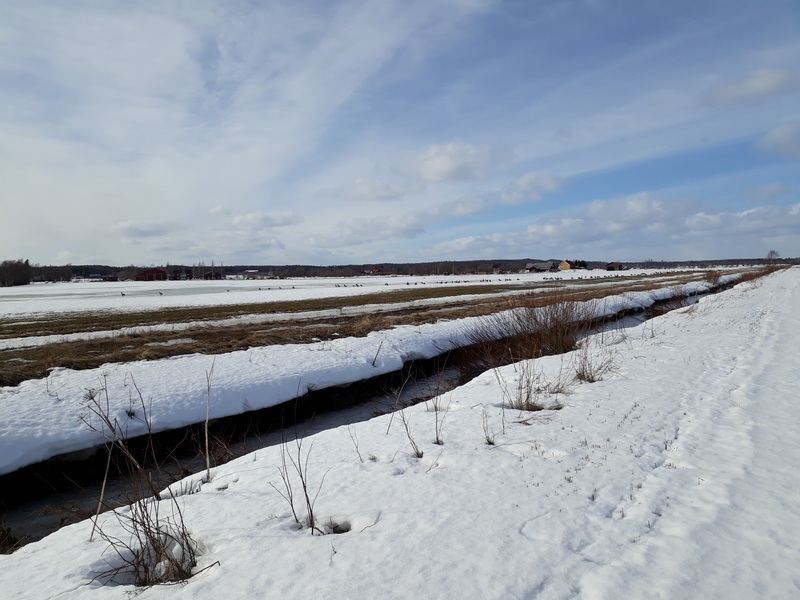 My main research focus is on large-scale and long-term dynamics and change in vegetation on land (European scale) through Horizon2020 projects coordinated by LTER. I also work with teaching and teaching administration. What is your relation to terrester/limnic field research? Through the work related to the vegetation part of the national environmental monitoring program mentioned above. The program aims to understand processes of forest ecosystems and we measure almost everything possible to measure, so even if I focus on vegetation, I work close to geologists, hydrologists, soil scientists and chemists in our forest monitoring. Towards the end of my undergraduate I started to be interested in a continuation of my academic studies, and during my master’s thesis I decided to pursue an academic carrier, staring with PhD studies. Why are research infrastructures of importance today? Without a well-functioning infrastructure with a harmonised measuring programme and routines for data storage, we will never be able to follow the effects of the large-scale environmental changes that is going on or learn more about ecosystem effects from environmental and climate changes. What will be your strongest contribution to SITES? 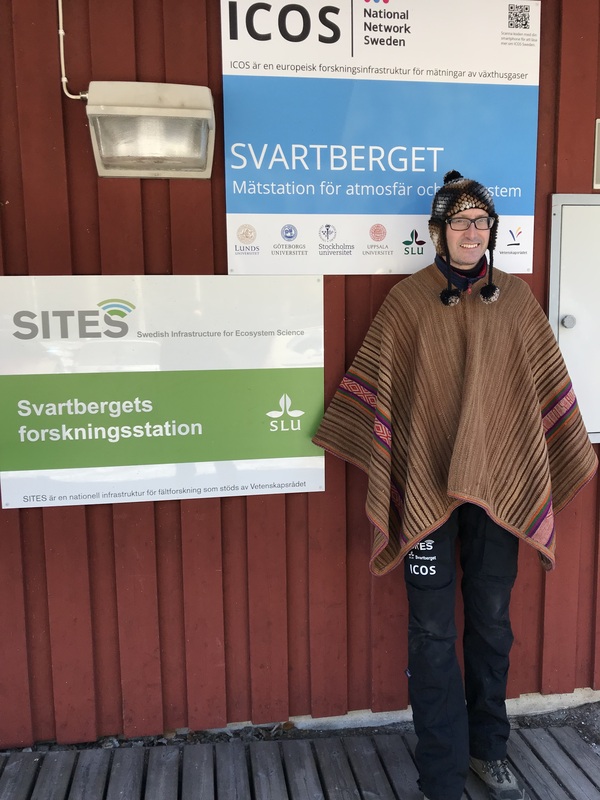 The connection to LTER and to link the Swedish field research stations to the European network for ecosystem science. Where is SITES in five years? In five years SITES is still an important part of the national field research and has a natural and important role in the large-scale European ecosystem science. Degernäsbäcken is a creek that runs past the agricultural fields of Röbäcksdalen research station. The stream, which is part of the SITES water monitoring program, is going to face some major changes soon. In the end of this summer the construction of the new E12 road “the western link” will start. The E12 road will cross over the creek at the same point as the current road, but the amount of traffic will be much higher. The change in the landscape offers an opportunity to study eventual changes in water quality that may occur with the increased traffic. 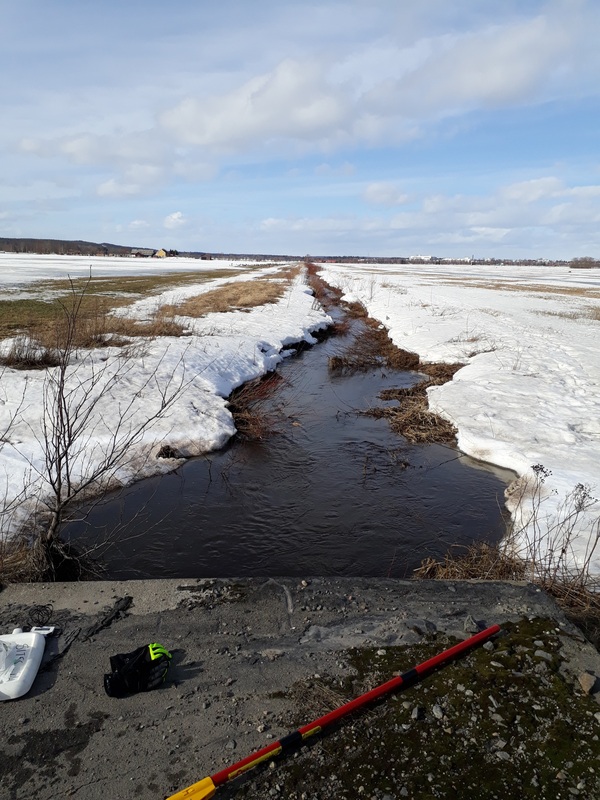 The creek is already sampled regularly as part of the SITES water, but this summer will be the last chance for additional sampling for other types of analysis. Map with Degernäsbäcken (straight) and Röbäcken (meandering) marked with sample points. 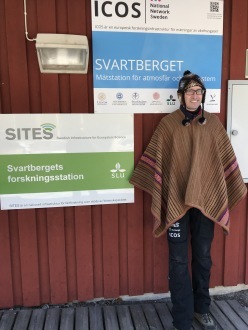 Johanna Wallsten at Swedish University of Agricultural Sciences. I´m from Belgium where I obtained a master’s degree in ecology and electromechanical engineering. After my studies I worked as an Automation Engineer. But recently, my girlfriend received a Postdoc position at the Abisko field station. We both like northern environments so we decided to take a leap northwards. I applied for the Research Engineer position and was selected. This position offers an interesting combination of fieldwork and computer analysis. I think this is where my background in data handling and automation will be useful. What is your relation to terrestrial/limnic field research? I got a taste of biology through my family from an early age. Later, during the course of my degree in ecology, I had several opportunities to connect with researchers within both terrestrial and limnic fields. In my master degree I spent one year in Sweden (Erasmus). During my Erasmus I took a course in limnology and I followed the Arctic Geoecology course in Abisko. I also followed a field course in the alps about plant inventarisation and assisted PhD students in Finmark and Iceland. Tell me about your first impresion of Abisko? Abisko is a magicical place with the lake, the mountains and the northern lights. But it is also extreme in many ways such as the weather, the nature, the isolation and the rate of climate change. The station is fairly big and has a lot to offer to all kind of researchers. It is a very nice place to work and the wilderness starts at the doorstep. What are your expectations for your assignment as Research Engineer at the most northern SITES location? My main tasks will be to take part in and work with the measurement’s programmes for SITES (SITES water and SITES spectral) and ICOS. I hope to learn more about measuring systems and the data they provide around Abisko and Sweden. I also look forward to learn more about the other SITES field stations and the collaboration.